Some of you know that I have been building a layout based on The Ffarquhar Branch of the Northwestern Railway. And in case your scratching your head - yes, it is from the Thomas the Tank Engine series on the Island of Sodor. However, aside from the faces on the engines thing, I am trying to make the layout as realistic as possible. I had the mainline finished and could run trains and was making progress on the main station at Knapford. But I wasn't completely happy with it - the layout or the station. The layout had problems with certain sections of track that could really only be resolved by tearing it up and starting over. The glass canopy over the loading tracks at Knapford was a dreadful compromise that made me cringe every time I looked at it. The canopies are really close to those used in the TV series (which is my "prototype"). The problems: The TV series has 6 tracks, this only has 2; there should be 2 tracks between each platform, this only has 1; and of course, there is no building. To solve the problems - I suppose I could buy another kit - but that would have been financially difficult, and I really didn't plan to have a layout that big! The kit is actually 4 canopies - 2 end-to-end. I found that a half length platform would be adequate for my needs. I wasn't going to run any long trains or long coaches. My passenger trains would consist of 2 short 4 wheel coaches, which could easily fit under a half canopy. I also decided that 3 canopies would suit my purposes (I have one left over). Track 3 is also a through track and can either load passengers off the same platform, or used as a small goods track loading into the brick building on the other side. (This is the same as tracks 5 and 6 in the prototype.) Below all that is the runaround loop. So now that I had the canopies, everything else would be built to match them. I had already started on the station building with my previous attempt. I had to cut about a half inch out of the middle to make it fit. It was built from Walther's modular building components. They are HO, of course, and I am using OO scale figures, which could present a problem. But I found that if I remove the threshold on each doorway and add a bit of styrene to the bottom of the door, they aren't too far out of scale. Then I painted the interior a buff color, over the black. Then I painted the bricks a rust color followed by a thin white water based wash that I quickly wiped off for the mortar. This shows the result - without windows - with the station crew on the funky platform that came with the kit - and a phone box and the stairs for the subway. Next I'll do some work on the platform. I found some craft foam that was just about the right height for the platform. It actually was a little tall. I considered sanding it down, but I was afraid I wouldn't make it even, so I decided instead to raise the track to meet the platform. This was cut from a sheet of Evergreen styrene that was called tile. 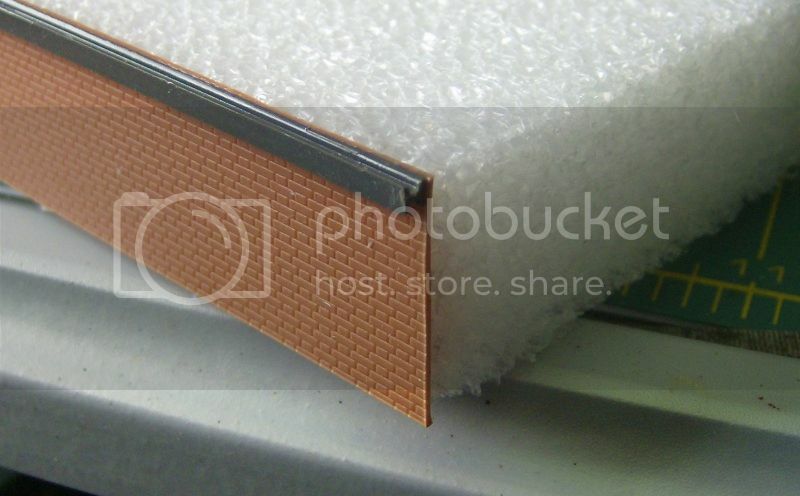 I found tile the correct size - and it easily cuts apart - in fact it can even be snapped off. 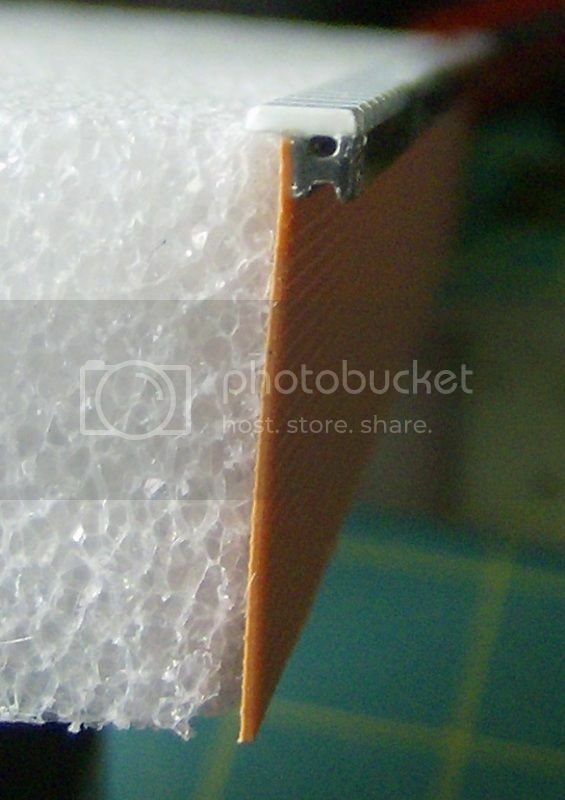 I also rounded of the outside edge and notched the lines along this edge. Oh, I forgot, I also added a pastry shop. I removed a window and all the brick, back to the pillar. 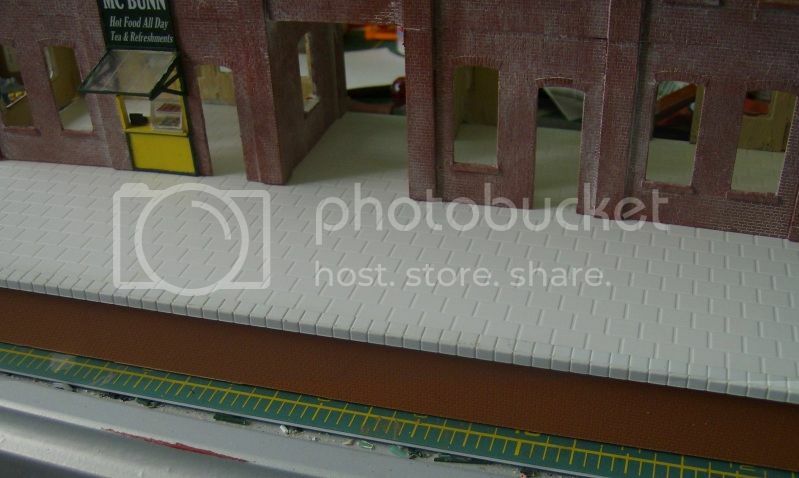 Then built up the shop with bits of styrene left over from the Walther's modular kit. The glass awning was actually from the first failed glass canopy. I wanted a display case for the pastry. I built that up from clear styrene. The real problem was the pasties in the case. I used Google image search, thinking I could use photos of real pastries and just reduce them - but nothing looked right. Then I found images of miniature pastries made for dollhouses and jewelry. The trick was to find photos taken from above - preferably on a tray. They had just the right amount of detail and shading. I printed them onto photo paper after sizing them for the display case. I think they turned out pretty well. I also made a roughed out cash register from a piece of wood and painted it black. The detail would be away from the viewer, so rough was good enough. I also created a sign in Word and printed that onto photo paper. A wood frame to stiffen it and then glued to the wall. 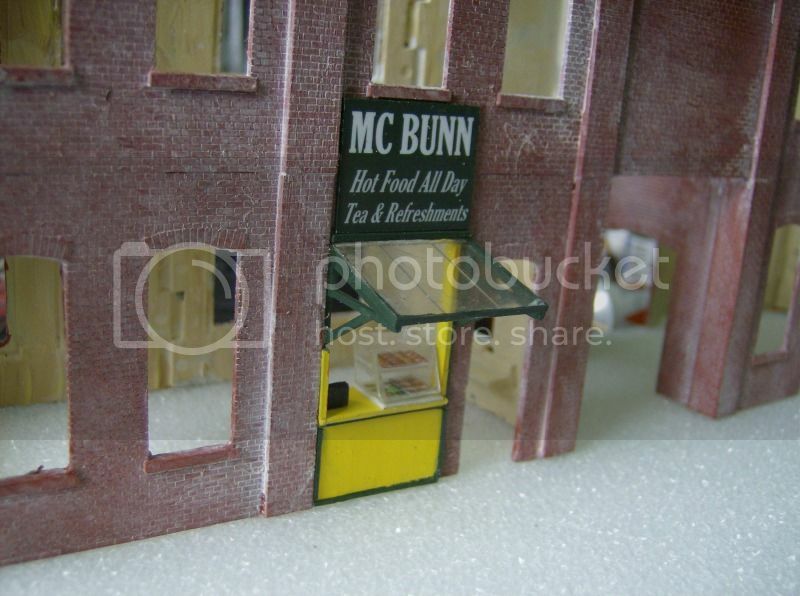 There will be walls to frame the interior - along with something to suggest the tea part of the shop and storage - along with a figure in a chef uniform (not sure where I will find that!). A light overhead and it is done. Looking good Rick. I like the small cafe/take away. The detail is great. Lucky you that Bachmann came to your rescue. I look forward to more instalments to come. Rick: I think the bit along the platform edge is called coping. It may or may not be whitewashed; I think white looks better. The white apparently started because of Zeppelin raids and blackouts in WW1. Just long enough for the coaches should be enough -- unless James is pulling, in which case the canopy will only be long enough for him and the coaches will sit out in the rain. Coping - thanks. It will be painted white. I'm holding off on that and the finishing the brickwork until I get the ramps built. I presumed it was some kind of safety feature - no idea it went back to WWI. James will just have to tough in the rain I'm afraid. But it was Henry that was really afraid of the rain. At any rate, the layout isn't big enough for Henry or Gordon. James will be the biggest engine. I like what I'm seeing there, Rick. Do you need a chef, or would a serving wench suffice? ...Do you need a chef, or would a serving wench suffice? Well, the TV series has a chef type guy - but a charming tea lady would probably be nice. This is very timely with me wanting to build my Grandson a Thomas layout although I think mine will start out a lot smaller. It's looking good, keep posting as I need ideas and encouragement. Rick mentions Xtrak, I assume this is software to build track plans. Is it available for Mac?